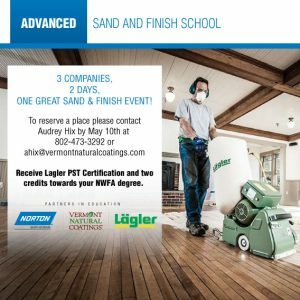 Join other professionals for an advanced Sand & Finish training at the new Lägler North America training facility in Denver, Colorado. There’s no better place to master advanced techniques for preparing a wood floor, sanding various species and minimizing scratch patterns. You’ll master the perfect techniques for using Norton Abrasives and PolyWhey® Professional Wood Floor Finishes as well as increasing jobsite quality and efficiency. While you’re here, enjoy all the Mile High City has to offer, from craft brews to amazing mountain views. Not only will you be receiving two credits toward your NWFA degree, you’ll receive a Lägler PST Certification. Cost: $175 per person. Lunch and one dinner provided. Students are responsible for their own lodging and transportation. Please RSVP by November 1 with Audrey Hix at ahix@vermontnaturalcoatings.com or by calling 802-473-3292. View the flyer for program highlights and more.